A will is a legal declaration that enables you to direct the disposition of your assets upon your death. Assets covered by a will include items such as your home, auto, bank accounts and investments. Ideally, your will should be drawn up by a lawyer. If you have young children, it’s important to select a guardian who would raise your children in the event of your death and that of your spouse. Your executor ensures that the settlement of your estate is properly administered upon your death. This is often a trusted friend, or an institution (such as a bank or a law firm), with the necessary expertise. Questions? 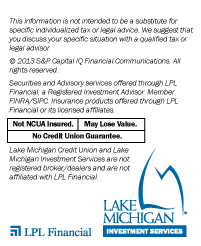 Contact Lake Michigan Investment Services at (616) 234-6524 for help getting your will started or updated.